When performing knowledge- and information-intensive tasks, such as making sense of text reports, users often perform “visual thinking” (e.g., marking, sketching, grouping) to externalize their thoughts. Knowledge workers thereby often switch between analogue and digital tools, which has a strong effect on the visual thinking strategies they use. 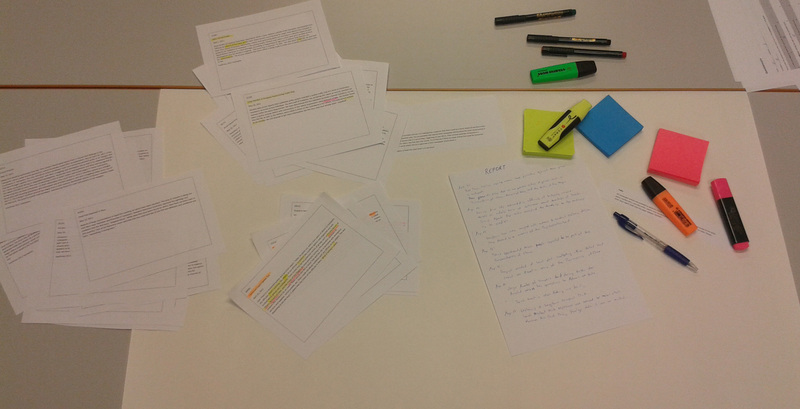 For example, seminar students may print out the papers they have to read, and annotate them on physical paper. However, they draft their report using text processing software. In this thesis, visual thinking strategies should be using analogue and digital tools should be observed in a controlled user study. The observations should then be used as design guidelines for a digital visual thinking prototype facilitating reading and making sense of multiple text documents on a particular topic. The material and room for conducting the experiment will be provided. The suggested environment for the visual thinking prototype is web-based, but this can be adjusted to the student's experience and preferences. This work can be done in a group or alone. Last update by Manuela Waldner on 22. Jan 2018. Comments to waldner (at) cg.tuwien.ac.at.